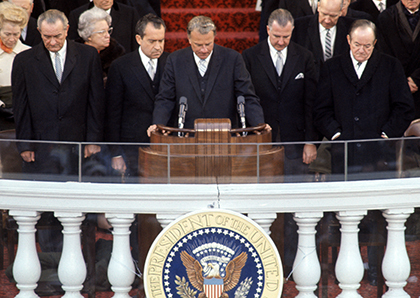 The trappings of religion have long been part of U.S. presidential inaugurations. Amid the secular pomp that heralds the start of a presidency are prayer services, an invocation and benediction, and a traditional (if extraconstitutional) mention of God in the presidential oath of office. 1Trump, a Presbyterian, plans to attend a private pre-inaugural prayer service with his family at St. John’s Episcopal Church, located a block from the White House. The pre-inaugural morning service is a tradition of sorts for St. John’s, which hosted similar events before the swearings-in of Franklin D. Roosevelt, Harry S. Truman, Ronald Reagan, George H.W. Bush, George W. Bush and Barack Obama. The church, founded in 1815, claims that every sitting president since James Madison (who served from 1809 to 1817 as the fourth president) has attended a service there. 2Six clergy will participate in the inauguration ceremony. The last seven presidential inaugurations, since the elder Bush’s in 1989, have had one or two members of the clergy offering prayers and readings, but Trump’s inauguration is scheduled to have six. The three who will give the invocation are Cardinal Timothy Dolan of the Roman Catholic Archdiocese of New York; the Rev. Samuel Rodriguez, president of the National Hispanic Christian Leadership Conference; and Pastor Paula White of New Destiny Christian Center in Apopka, Florida. The three who will give the benediction are the Rev. Franklin Graham, president of the Billy Graham Evangelistic Association; Rabbi Marvin Hier, founder of the Simon Wiesenthal Center in Los Angeles and its Museum of Tolerance; and Bishop Wayne T. Jackson of Great Faith Ministries International in Detroit. Aside from Dolan and Hier, who are Catholic and Jewish, respectively, the group is comprised of evangelical Protestant leaders. None is from Trump’s Presbyterian denomination. 3Trump will be sworn in with two Bibles – one that Abraham Lincoln used at his 1861 inauguration, and a personal one given to him by his mother. Obama also used two Bibles – the Lincoln Bible chosen by Trump and one owned by the Rev. Martin Luther King Jr. Four presidents, most recently George H.W. 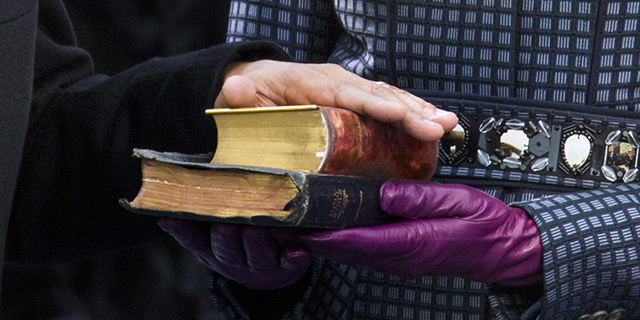 Bush, were sworn in on the King James Bible used by George Washington in 1789. 4After taking the oath of office, presidents traditionally say “so help me God.” This reference to God is not mentioned in the Constitution, which contains the text of the presidential oath in its entirety. Chester A. Arthur, in 1881, is the first president on record to have uttered “so help me God” at the end of the oath, although earlier presidents’ inaugural addresses did refer to God and heaven. A not-quite-raging debate lives in the blogosphere over whether the phrase was used at George Washington’s inauguration, with various proponents claiming he said it, may have said it or did not say it. 6The day after the inauguration, the president will attend a prayer service at which prominent clergy from different religions will pray for the country. The setting for this service will be the Washington National Cathedral, which is affiliated with the Episcopal Church and has hosted all but two of these services since Reagan’s second inauguration in 1985, the exceptions being those following Bill Clinton’s inaugurations in 1993 and 1997, which were held at Metropolitan African Methodist Episcopal Church in downtown Washington.